Coming from a tropical country, I grew up eating plenty of papaya. I have always discarded the seeds when I cut up the papaya, until I learned how to eat papaya seeds. And the health benefits are rather impressive too. 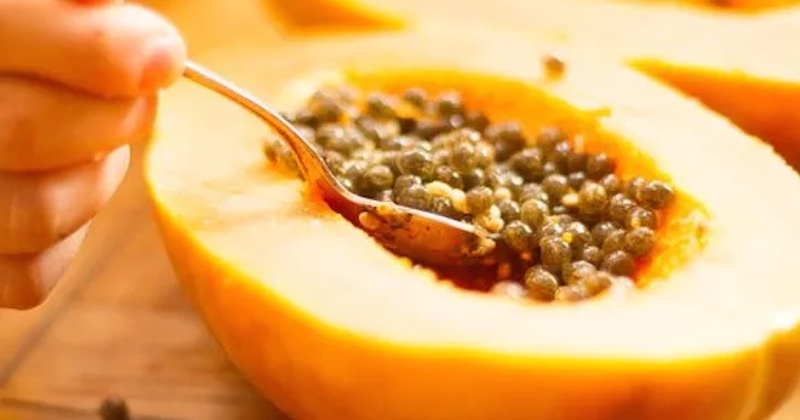 Papaya seeds are crunchy to the bite, and have a strong flavor that is a cross between mustard seeds and mild peppercorns. The papaya fruit is an anti-inflammatory food that is rich with numerous health benefits that include preventing cancer, reducing heart disease, lowering blood sugar level, improving digestive health, wound healing and many more! Read more about the papaya fruit and its cancer-fighting leaves. If you’re like me, you most likely discard the seeds too—but no more, if you knew what amazing health benefits they provide. Papaya and its seeds have been proven to have antihelminthic and antiamoebic activities. “Helminths” and “amoeba” are harmful microorganisms that are found in human intestines. In some situations, they can cause diseases and infections in humans. When left untreated, these infections may lead to dangerous consequences. These harmful microorganisms invade the intestinal walls and cause ulcers, bleeding, increased mucus production and severe diarrhea. In a study, 60 Nigerian children with stool microscopic evidence of intestinal parasites received 20ml (about 4 teaspoons) of papaya seeds and honey, or just honey alone (placebo), in two randomized treatment groups. 7 days later, repeat microscopic examinations were conducted for intestinal parasites and it was found that those given papaya seeds and honey were cleared of parasites. Without significant side effects. The papaya fruit is one of the most effective foods for healing of the digestive system. Its seeds contain strong antibacterial and anti-parasite properties, making them powerful in removing the harmful microorganisms in your intestinal tract for a healthy digestive system. Due to its potent anti-pathogen activities, eating a tablespoon of papaya seeds can help stop food poisoning by killing the bacteria that are causing the problem. Papaya seeds contain phenolic and flavonoids—powerful compounds that have high antioxidant activities to retard tumor cells growth. The phytonutrient isothiocyanate may prevent cancers of the colon, lungs, breast and prostate. Traditional Chinese Medicine has been using papaya seeds for centuries to improve the vital functions of liver by effectively removing harmful toxins. It has been reported to be even beneficial for individuals suffering from fatty liver (liver cirrhosis). Eating one or two teaspoons of papaya seeds every day is said to be efficient for detoxifying the liver. Of course, a change of dietary and lifestyle (quit drinking) are also crucial to see any improvement at all. Papaya seeds have potent medicinal values that are very beneficial for detoxifying the kidneys. The antibacterial and anti-inflammatory properties of the seeds protect the kidneys from toxin-induced inflammation. As with the papaya fruit, its seeds hold powerful anti-inflammatory properties that fight against inflammation in the body such as arthritis, joint pains, gout and asthma. Two very important enzymes in papaya seeds—papain and chymopapain are the key to reducing inflammation that are associated with these conditions. Studies in lab rats show promising improvements in cardiovascular health. Carpaine—a compound found in all of papaya including the leaves and seeds—were found to be effective for decreasing systolic, diastolic, and mean arterial blood pressure. For centuries, the Indian culture has been eating papaya seeds as a form of natural contraceptive. Nature has designed them such that they can be taken daily without side effects. And what’s best of all, is that the sterility is reversible. Fertility can resume to normal, once you stop taking the seeds. If you are planning to conceive, avoid eating papaya seeds. So, depending on how you look at it, this “side effects” could affect some people, yet could be a benefit for others. Studies in male rats show low sperm production from being fed papaya seeds for a controlled time. The results showed that oral administration of papaya seed extract prevented ovum fertilization, reduced sperm cell counts, sperm cell degeneration, and induced testicular cell lesion. These observations led to the conclusion that papaya seed extract could induce reversible male infertility and, therefore, could be used for pharmaceutical development of a male contraceptive. Another investigation was conducted to study the effects of papaya seeds on female rats. Oral doses of 100 and 800 mg/kg/body weight, were given to pregnant female rats once a day on days 1 to 10 after they mated. In the female rats that were fed the high dose of 800 mg/kg/body weight, there was noticeable vaginal bleeding, and fetuses were stunted, but did not have external deformations. The results concluded that a low dose extract of papaya seeds does not negatively affect prenatal development, but high doses of papaya can harm the fetus and cause abortion. There are various ways of eating papaya seeds. I scoop a tablespoon of the seeds directly from the cut fruit and eat it with the fruit. They taste good in this combination. 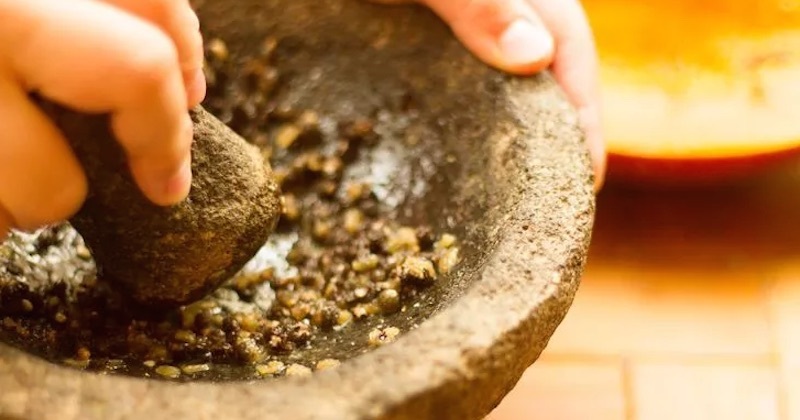 You could pound the whole lot of the seeds from a fruit, with your mortar and pestle and keep them in a small jar in the fridge for no more than a week. If you intend to keep it for longer, store them in the freezer and thaw before use. You could also dry them out under the sun or using a dehydrator. When dried, pound them or use your food processor to grind them into powder form that can be used in your food. Sprinkle in salad, soup or oatmeal. Add one or two teaspoons of papaya seeds in your juicer or blender when preparing your daily juice. They get crushed and can be chewed as you enjoy your juice or smoothie. Papaya seeds are very potent in their antibacterial properties. Start with eating no more than one teaspoon a day, whether raw and directly from the fruit, or added to your foods. If you are able to stomach it, and not planning a family (see potential side effects above), you could eat up to two teaspoons a day without any adverse effects. Add a little raw honey as desired. In the study on killing parasites in the Nigerian children, 20 ml (4 teaspoons) were used daily without significant side effects. If you’re taking papaya seeds for this purpose, take no more than 7 to 10 days, depending on your body size. As in all good things, they may cause a reaction when taken in large amounts. Do check out the amazing health benefits of papaya fruit and their leaves too! This is a very interesting article. I particularly like that you discuss the benefits, how to prepare and caution against using too much of it. A complete synopsis of papaya and it benefits. Thank you. Plan to pass it on. This is very helpful. I have tried them, they taste like a pepper corn. My grandmother gave us papaya seeds if we had an upset tummy. That was almost 50 years ago. I love the seeds. The taste reminds me of wasabi. Thank you for sharing its benefits. I used to eat the seeds by pounding them fresh … first thing in the morning on an empty stomach … it tastes like wasabi. At first I cannot stomach it but due to its health benefits, I did. I have known that eating papaya on an empty stomach is good to clean the digestive tract. Also, eating garlic on an empty stomach will help get rid off parasites from the digestive tract. My grandmother used to give me this when I was a little girl. I read somewhere that a person needs to start VERY SLOWLY with papaya seeds to monitor how you react, like literally three seeds and go from there, they are that potent. You can always add more from there. Thanks for the informative article ? I learned from a book written by Dr Alfred Vogel, papaya seeds gets rid of every type of worm in the human body, I’ve personally used it with my family, and still continue to do so, awesome.